The Tamil National Alliance (TNA) leader R. Sampanthan’s recent remarks on the ‘lotus bud’ (Nelum Pohottuwa)’ received a wider attention of many concerned parties. Sampanthan stated, “If you (Nelum Pohottuwa party attached to former President Mahinda Rajapaksa led alliance) persist with this agenda, I want to tell you (Tamil) Eelam will bloom not on account on us, but on account of your lotus bud”. Sampanthan’s verbal attack on Rajapaksa came as a response to Rajapaksa’s pre-poll campaign statement in which he said, “A Tamil Eelam would bloom following the local authority election.” According to Sampanthan, Rajapaksa’s campaign is a “malicious, vicious and fallacious propaganda campaign”. Sampanthan’s remarks were not a mere response to Rajapaksa’s statement. It came in the backdrop of a situation where Gagendrakumar Ponnambalam, leader of the Tamil People’s Front (TPF), Suresh Premachandran, leader of the Eelam People Revolutionary Liberation Front (EPRLF), and Chief Minister of the Northern Province, C. V. Wigneswaran are spearheading a radical campaign, attacking TNA’s position on the Tamil nationalist issue. The trio even set up a civil society organization, Tamil People Council (TPC), with a common agenda to attract wider support from the Tamil people, and the TPC completely rejected the interim report on the Constitutional Assembly that the TNA led by Sampanthan supports. Sampanthan in his Thai Pongal message ‘prayed’ for a new Constitution in which a new power-sharing mechanism is being proposed. It can be assumed that Sampanthan fears Rajapaksa’s propaganda campaigns in the South would intensify TPC leaders or similar entities to lead radical campaigns in the North against the TNA and hamper the support that the TNA aimed to gain in favour of the new constitution and the proposed power-sharing mechanism. Sampanthan’s fear is not unreasonable. Yet, his fear sheds light on the fragility of the proposed power-sharing mechanism. The mechanism was developed based on a consociational model that was theorized by Arend Lijphart. The proposed power-sharing mechanism has four main features – a grand coalition government led by ethnic elites representing different ethno-segments of society, territorial autonomy based on ethno-segments, ethno-segment proportionality in the voting system, government and public sector, ethno-minority vote that enhances difficulties in changing the proposed mechanism. Lijphart’s consociationalism was very popular and adopted by many in finding sustainable solutions to cultural conflicts. Lijphart listed in 2002 sixteen consociational regimes in the 20th century. However, Lijphart’s consociationalism has failed to deliver sustainable results due to inherent weaknesses of the mechanism. One such weakness caused Sampanthan’s fear – emergence of radicals that can derail the grand coalition agreement. However, Sampanthan will not be able to overcome his fear even after his prayer for a new Constitution was answered as the problem of radicals is not confined to the pre-agreement period but even after entering the agreement, since consociational mechanism is not immune to the problem of radicals. Some of the critiques of Lijphart, for example, Philip G. Roeder, Alvin Rabushka and Kenneth A. Shepsle identify the said weakness as ‘the second-generation problem’ in a context of post-agreement period. Their remarks were made after a careful observation of consociational regimes that entered into power-sharing agreements. Roeder observes, even the ethnic elites were initially sincere in their commitment to power-sharing, a majority group tends to be inclined to focus on the problems of governance and maintaining political power in bringing decisive governance when the contract becomes a reality. It results in raising questions as to the majority group’s continuing commitment to the principle of proportionality in civil service recruitment, regional allocations, or representation in the decision process. In such a context, the original power-sharing agreement may become difficult to maintain (Though it was not a consociational agreement, even Yaha Palana agreement became difficult to maintain. Even the leaders who were sincere in their commitment to bring Yaha Palanaya in the beginning, could not maintain the agreement). As a consequence, power-sharing institutions may be threatened when ambitious, up-and-coming leaders with more radical demands engage in outbidding behaviour to outflank the moderate elites within their own community. On the other hand, political leaders of the majority would also find it difficult to uphold a long-term commitment to the original power-sharing arrangement when they come under pressure from their constituencies as they see the power-sharing agreement as a disadvantageous arrangement to their narrow self-interests. The situation would allow more radical leaders to emerge and further weakens the ethnic balance of power. For example, Serbian leaders who succeeded Josip Broz Tito in Yugoslavia were outflanked by more nationalistic leaders like Slobodan Milosevic. Subsequently, Milosevic also was outflanked by more radical leaders such as Vojislav Seselj and made holding the federation more difficult. Therefore, Sampanthan’s fear is a real, and provides us a valid reason to reconsider the effectiveness of the proposed power-sharing mechanism. It is important to note that Sampanthan’s fear will not fade away even if his Thai Pongal prayer for a new Constitution was answered. Sampanthan should no go round the Lotus Bud in search of Honey. instead, he should go in search of it from the “yahapalnaya” Government, who have neither done anything good for the Sinhalese nor the Tamils. Sampanthan/Sumanthiran’s propping up of the government has put the Tamils In a junction of No Go Zones. Where did you find the above proverb? I suspect it must be from Matysa Purana? Could you confirm it? Timing is the key. The moderate elite should have known that there would be radical elements emerging on both sides eventually. But the followers of the radicals on the other hand are largely respondents to more immediate problems, than long term ones such as power sharing. They respond well to problems that warrant instant gratifications. The moderates on both sides had responsibility to address these problems of both sides as soon as they came to power. Some of those solutions could have been more radical but given they were implemented early enough in the coalition, by the time of elections, the adverse opinions due to those would have been minimised. Here, Sampanthan, Ranil and Mithri trio should have addressed the more pressing matters of the prisoners, the disappeared and the occupied land cases as soon as they came to power. This would have reduced the ammunition to the Tamil side of radicals. This could have caused resentment in the Sinhala side, but that would have been diminishing with time. People have a lot of common sense these days, its only a matter of making use of it in the right way is the duty of the governing. On the Sinhalese side, there should have been quick and early action by the PM and Pres about corruption and the corrupted individuals. There can not be any let up on good governance especially when you come to power on that platform. Corrupted individuals, no matter how democratically powerful they are should have been brought to justice. People would have resented first, sure. But they would have come to realisation and would have started to admire the government by the time of the last local council elections. The strategy by Ranil to delay everything to keep everyone on his leash was the main reason for this fragility. He hadn’t considered the people factor here. MR claimed ~ “………..A Tamil Eelam would bloom following the local authority election.”. This is recycling the fear started by SWRD B in 1956. Sampanthan ~ “……………., I want to tell you (Tamil) Eelam will bloom not on account on us, but on account of your lotus bud”. It is unwise to take this literally but revist history. Let us not forget that Tamil liberation movements came into being because their grievances were never addressed. Pogroms only contributed to breakdown in law and order. Continued oppression will not smother the thirst for freedom..
National anthem Provincials etc. Now they have only Aspirations. This is not me. I thought you check against the email address(which is not published) to filter out identical pseudonyms. The red somass types what the jungle green somass believes in. Does it matter whether the typist is red or jungle green as long as the message contains complete bigotry. You should be happy you found one more racist. i would like to remined the Pogrome ,the atrocities against the Tamils in 1983 was organized by the the unp, the dharmistia j.r. .ranil was a cabinet Minister then.tamils including hon. sambandan should not have much confidence in ranil.ranil is a liar and to be in power could be worse than mahinda,if the necessity arises.the bla bla spineless Humbug hypocrite Buddhist sinhale president is worse.i do not know how the Tamil Problem could be solved,for the satisfaction of the s.l.an Tamils,but to beleive in this government is just a Illusion.probably the muslims will make a better deal with the government and will oust the Tamils in the e.p. leaders should start thinking beyond ethnic lines and establish a secular political culture , if a sustainable solution is needed. However not sure why MaRa chose the Nelum bud rather than a fully bloomed Nelum. Will it ever bloom or whither away after the local govt elections? LTTE chose Gloriosa Lily, as the national flower for Tamil Eelam, which is a poisonous flower. and we all know the results! Thanks for your contribution to literature. I am sorry I can’t remember where I read this Pro-Verb. Is it cited in 13th century “Sidat Sangarava”? Not only Sampanthan’s fear but also every tamil in Srilanka fear when the next episode of national level violence against Tamils going to happen? The way southern politics goes at the moment indicate that is very likely that is going to happen again. In the South they enjoy the taste of blood of Tamils. This time they initially tested with Muslims as well. That implies they are going to go too wider level including Muslims. Almost all the LG election analysis and advices that are coming out in CT are from Shaymon Jayasinge, Gamini Jayaweera, Thero De Silva, and Malinda Seneveratne, Rajeewa Jayaweera….. So Siri Gamage, Lionel Babbage like analyses, whether right or wrong, but attempts to try a wholistic view, is not yet here. The important question came out of the LG election is who is going to bell the cat. Before unity Government was formed belling the cat was not possible. But LG election has clearly shown that Yahapalanaya, whether it can do or no. will not bell the cat. The important point is Opposition used racial cards in local election to win. It is not on the localities where Tamils and majority community is sharing. This was used all over the south. But nowhere Yahapalanaya went and said to Sinhalese, the Tamil Eelam will flower out of Lotus Bud, not by the devolution as a solution they discussed under Steering committee draft, if they voted for Old Regime. We can see, latter in this, if belling the cat really would make any difference in Tamils future. After the rebels are defeated, any attempt to solve Tamils problems is an act of closing the gate after the horse bolted. The cat, which is letting out minority bashing for election victory during the election times, remains uncontained or not belled. This is the one revealing the unhidden secret behind the failed of Dudley-SJV coalition in the 60s. When Majority –Majority Collison is not able to work out as the fact of presence of minority in Lankawe can be used to destroy that coalition, there is no way ever a Majority-Minority Coalition becomes successful. Slap Party has no reason to split from SLFP after the Unity government, which’s main purpose was to find a solution to minority, was formed. 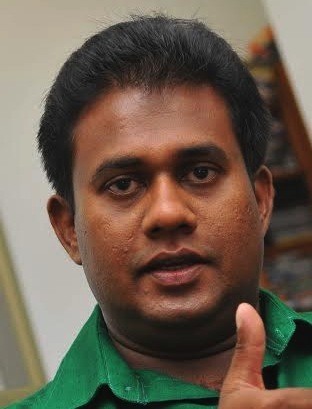 After LG election, Slap Party had proposed to SLFP various reunification proposals, including the Leadership of SLFP to Old King, indicating basically there is no political, policy or philosophical differences exiting between Slap Party and SLFP. This is explaining other than the objection to resolve Tamils’ problems, there is no practical difference between. Further, JO’s reluctance to join Slap Party is reinforcing this hypothesis. Majority -Minority association does not take place when every time the Muslim – Sinhala Government or Sharia-Yahapalanaya government is formed. In fact, it is only dived and rule. It achieved only MMDA, standardization or random perks for Muslims Politicians and Business men on the cost of Tamils’ enervated employment and enterprising activities, but never built any security measures to Muslims as community. The criminals like Hakeem and Rishard has made the Muslims mass nothing but “Hatted or Burqa Modayas” by selling them to buy impunity for their crime from the Sinhala Masters. Until by a grass root change the Mahanama installed Sinhala Buddhism is tamed, there is no hope to minorities associating them with the majority (Sinhala Buddhist) government. We attempted to bring out this hard reality learned by the 70 years of humiliation, to the Western Diplomats, like the Ex. Secretary John Kerry, in forming a coalition government to rule Lankawe. West in understanding making Israel to accept Palestine is not easy. But the West is thinking removing the freedom fighting rebel movement branding them as Terrorist and plaster TNA mouths should make Sinhala Buddhism to accept the Tamils. The coalition failure is failure of the planning in its formation. (Coalition failure is different from the election debacle. Election was lost by not delivering the promises by the government and minority bashing by opposition to achieve victory without pledge any positive promises to enhance the life the majority). Assuming the present set to continue until next election, SLFP has no future at all. New King cannot stand in the election unless Ranil cooperate with him. There is a good chance Ranil getting the EP seat. If SLFP and Slap Party place one single candidate, SLFP can bring with it, its inauspicious Mullivaaikkaal curses it have earned, but not votes. If Ranil wins the presidency, then the Unity government will come to an end from SLFP side as it will lose its current leader. The leadership will automatically return to Old Royals. Old Royal will not put up with UNP for the remaining six months. Ranil may dissolve the parliament to use if there was any UNP wave present that time. New King will be out of all Political Scene completely by 2020 January. Even if UNP wins the election, under the new system, UNP will not be able to form the government. TNA will not have even 10 seats in North East. JVP would turn out to be much stronger. It is unlikely JVP supports a UNP government. This would remind the 2006 UPFA budget dilemma. Even if UNP forms a government it cannot bring in any changes, unless that time opposition party approves it. If UNP wins, the EP and Parliament, it will become very scary nightmare to India. India will be reminded 1977 JR’s administration but West may like to rejuvenate its relationship with Lankawe. The net result is, after 2019, the Secret Solution will be not there. 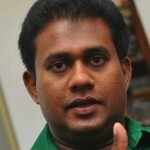 If UNP has the presidency and UNP has the parliament then West will not support Tamils. So, most of the scenarios are justifying Sampanthar’s fear. More late it goes, worse its result will get. Instead of totally eliminating discriminatory remarks from all nationals including politicians, it is not entertaining to regurgitate such garbage subject all the time. There is nothing of intellectual value in these remarks. Mahinda bashing will not solve Sambandan’s problems within his own constituency. It only antagonizes the partner (i.e. majority of Sinhalese) his constituency ultimately will have to negotiate with. Sambandan’s seems to be a strategy of furthering the division. Waiting to see a real moderate voice emerging from the re-alignment of popular forces within the Tamil polity that is in a flux as shown in the LG polls.